Temporary Settings can make data entry even faster. 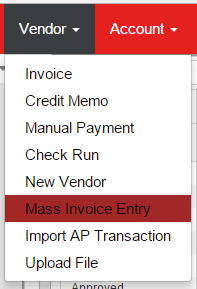 These settings must be updated each time you use the Mass Invoice Entry Screen. Location Selection: identical to the Vendor Selection, the Location field can be cleared out, or set to the Location from the last invoice entered. Location Position: set where you want the Location selector to be located in the entry area. When set to ‘Top’, the Location selector is placed in-between Vendor and Number, with the remaining fields being shifted to the right. Account & Amount: the first Account field will auto-populate with the Vendor Default Expense Account (if any). The corresponding Amount field will auto-populate with full Invoice Amount. What can I do with the ‘traditional’ AP Invoice screen that I can’t do with the Mass Invoice Entry screen?